Official End Of Birthday Week | how's it going, eh? Don’t you know that it’s not one day of celebrating your birthday, but a whole week???!! 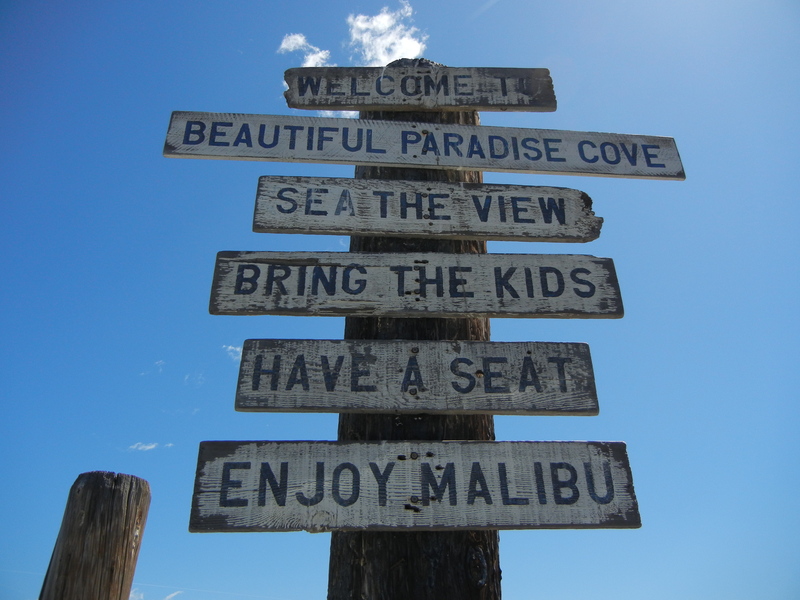 Today my family took me to Paradise Cove in Malibu for a birthday breakfast. 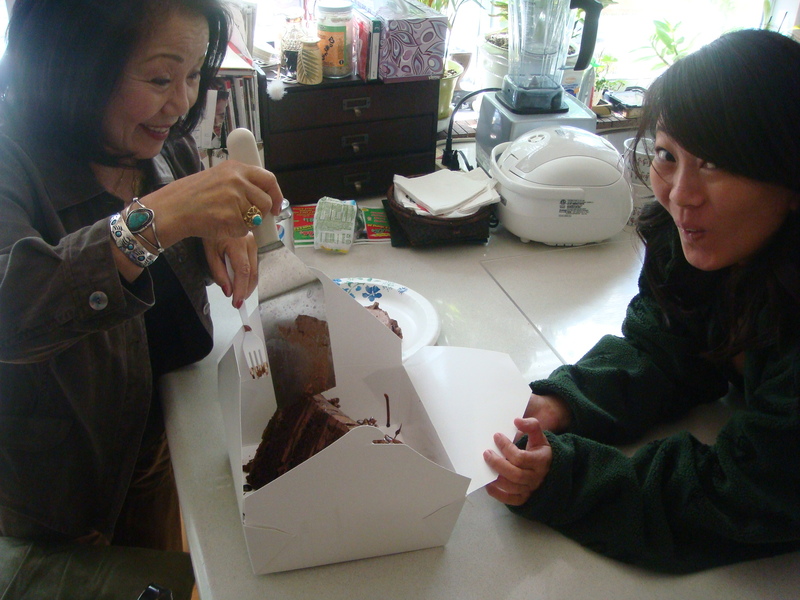 Actually, it was also to celebrate my mom’s birthday in April, which I will miss since I’ll be in Canada. Yesterday was gloomy gloomster, but today was GORGEOUS!!!! My mom was like, “Praise God! Halleluiah!!”. We had so many cameras between the 4 of us, my sister Ashley was getting so embarrassed. When I said, “Look at the Asians with all their cameras!!! !” really loudly, she got even more embarrassed. My sister is always embarrassed of me. 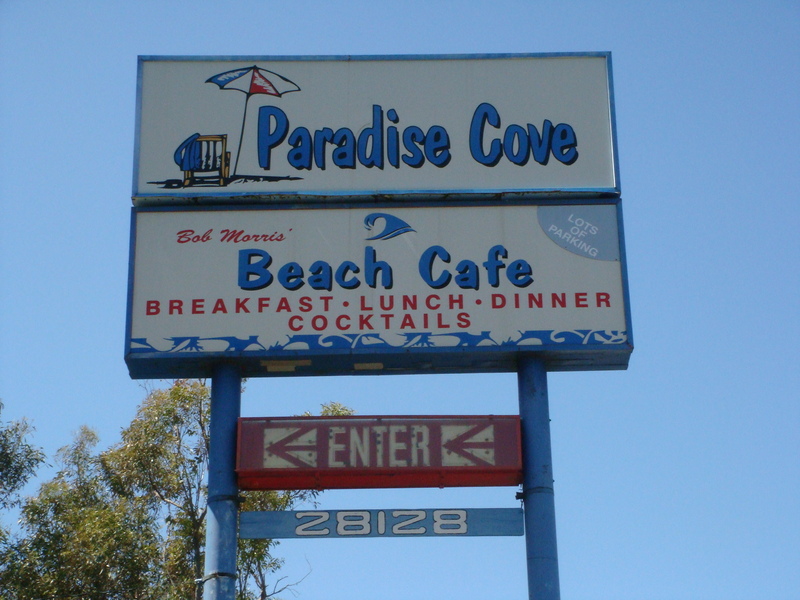 Paradise Cove is a restaurant situated right on the sand. It’s mucho busy, because of it’s prime location. That’s my dad imitating my unphotogenic smile. Well, this is where it get’s really awesome. 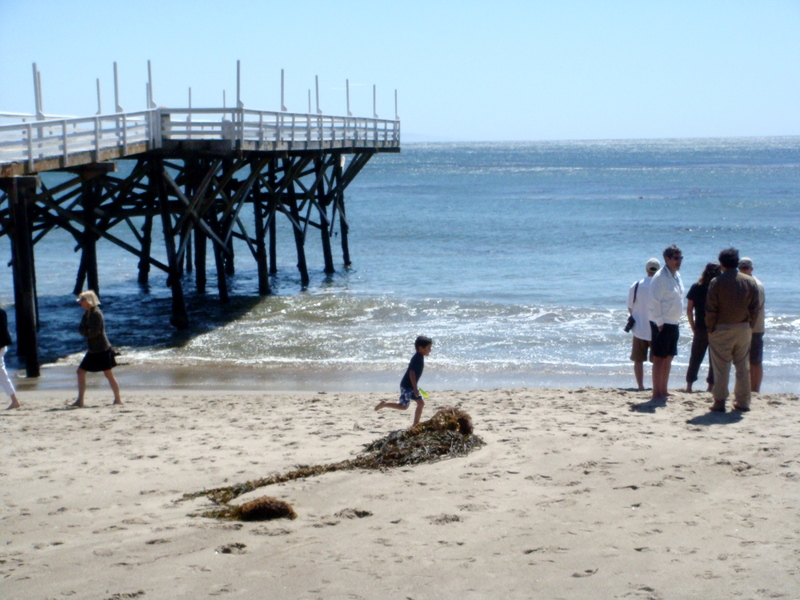 Paradise Cove has crappy crap service because they know people are going to keep coming back because of it’s amazing vicinity to the beach!!!! We sat, + waited. And waited. No one even offered us water, or even looked at us. I was like, “Am I going crazy, or are we invisible?!”. We would wave our hands at the myriad of servers bustling about + no one would even glance our way. At one point, my mom + I put both our hands up high in the air, waved frantically + yelled, “Help!!!! Help!!! Somebody help us!!! !”, as if we were drowning in the ocean. This still didn’t work. After 20 min of these antics, we finally got the attention of someone, + said, “Can you help us find our waiter?!”. How crazy is that??? Turns out a waiter was late or missing or drunk or idon’tcare, + they couldn’t figure out who to substitute for his stations. Morons!!! Well, I’ll drink to that! 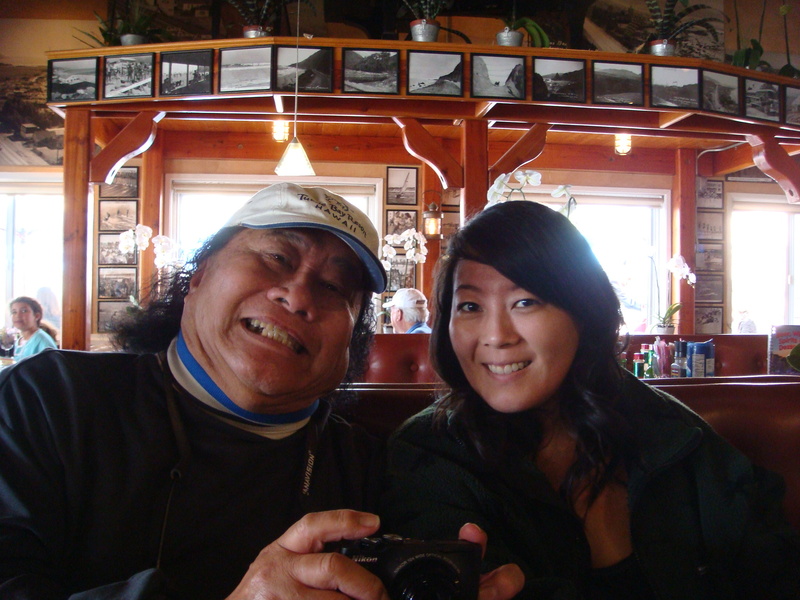 The waiter we were so graciously given was really nice to us, partly because I think he was relatively scared of me. Here I am telling my dad to get the camera out of my face. Coming from a family with a First Assistant Cameraman, we are pretty used to being in front of the camera, but sometimes we have our limits. Our meals were ooookay, but we were so famished after waiting for almost an hour for our food that we devoured our plates! 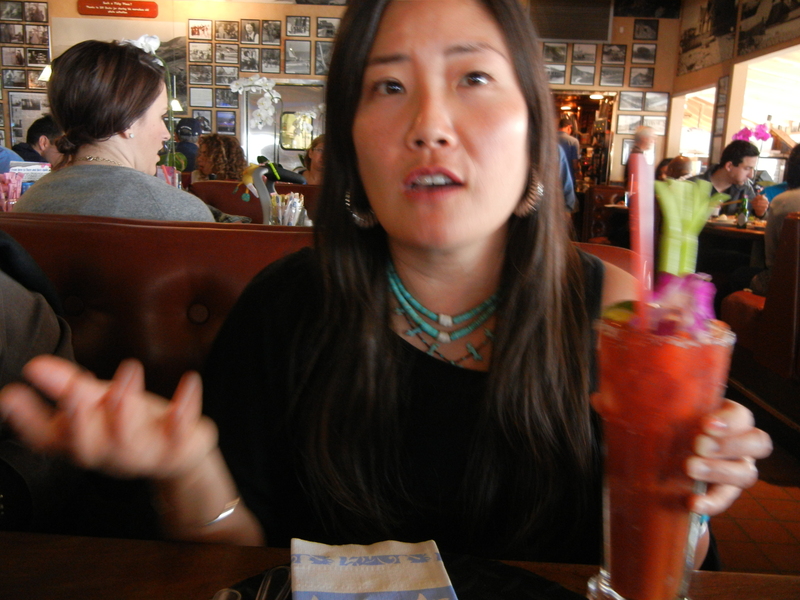 The waiter asked if I wanted a second bloody mary + my dad said, “Get one! You’re not driving!”. Yo! You don’t need to tell me twice!!! 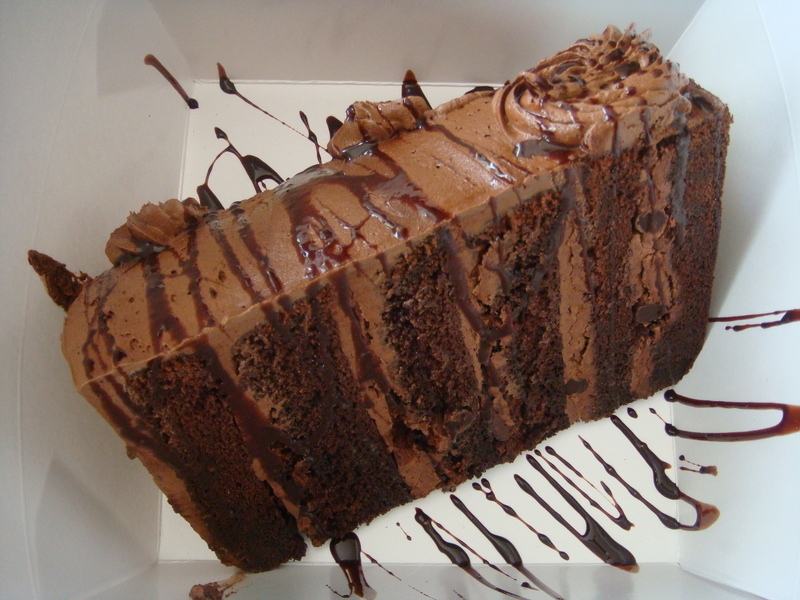 We got the Mile High chocolate cake to go (oh don’t you worry, pictures to come) + high tailed it the hell out of there. Our waiter gave us a birthday discount + didn’t charge us for my dad’s egg benedict since they got the order wrong! You better recoginize!!!! Check out my mom’s scary mafia sunglasses. 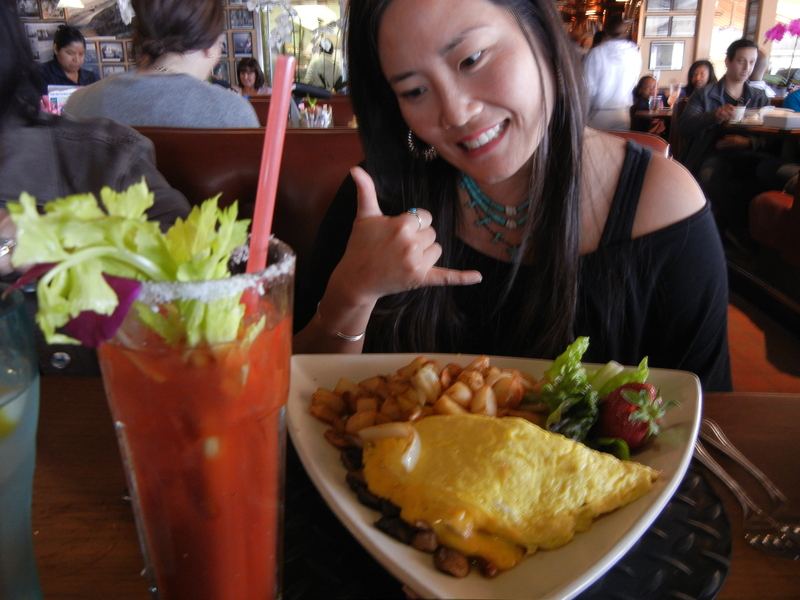 It’s Southern Californian bliss steps away from the restaurant! 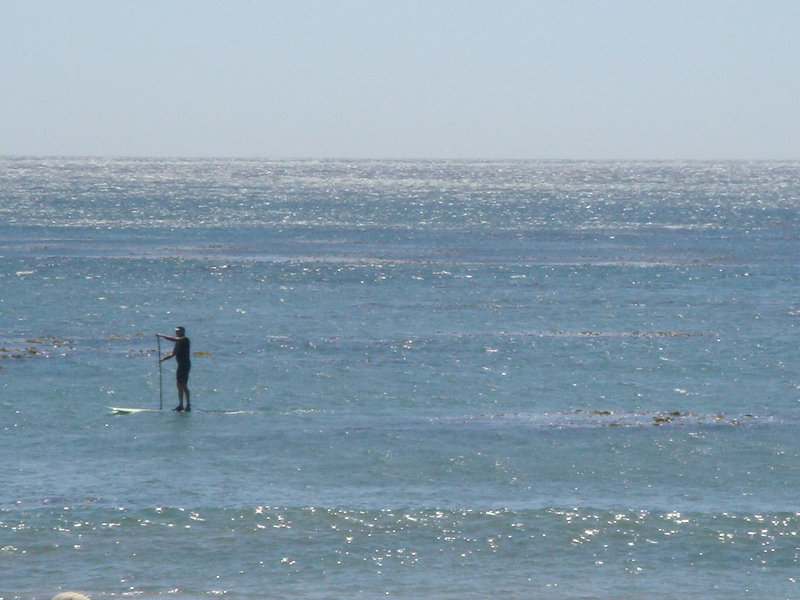 The stand up paddle boarder made us all think of Jeff. Wish he was there with us! Insanely beautiful day!!! Idyllic!!! I’m really going to miss this weather. It’ll be raining in Vancouver all this week, according to forecasts. I don’t know if I’ll be able to adjust, y’all!!! Okay, back at home, check out the Mile High cake!!! It was the Andre the Giant of cakes!!! We all thought it was an overly generous serving. More evidence of our waiter’s fear of the Japanese samurai spirit. Look how excited!!!! 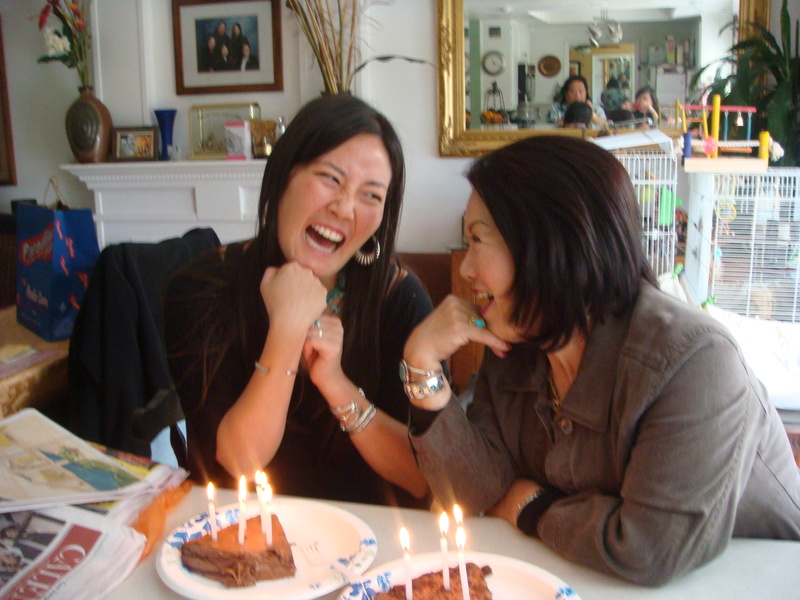 How cute are my mom + sister? Birthday candles. 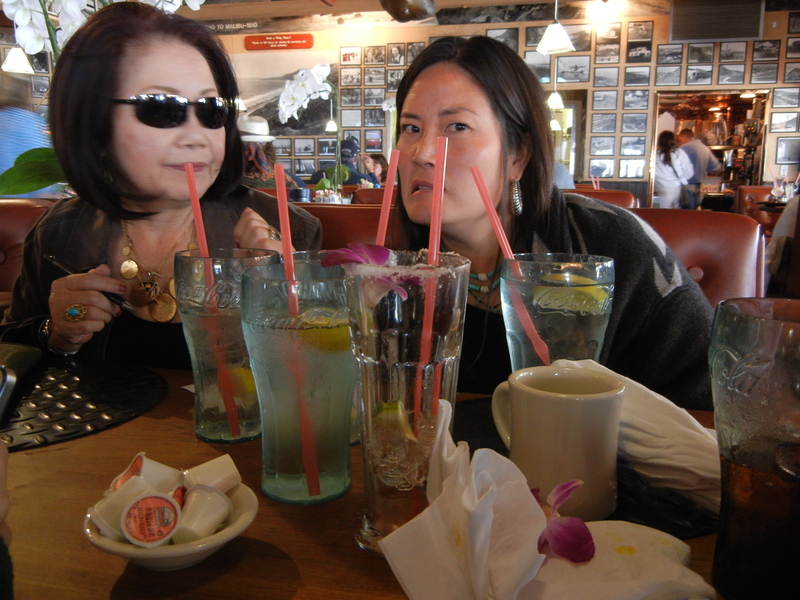 My mom + sister are sickeningly photogenic. 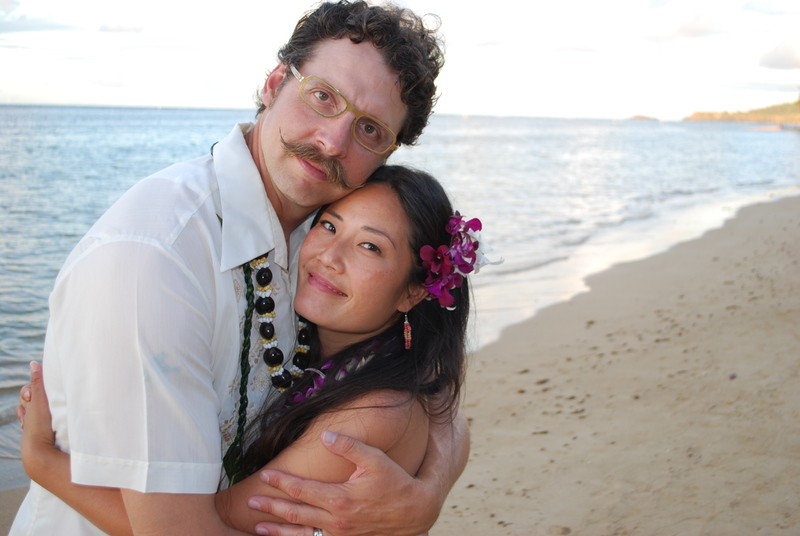 I have to try really hard at it + have messed up numerous family photo opportunities. Here I am trying to emulate my mom’s “photo pose”. I just look like maniacal. 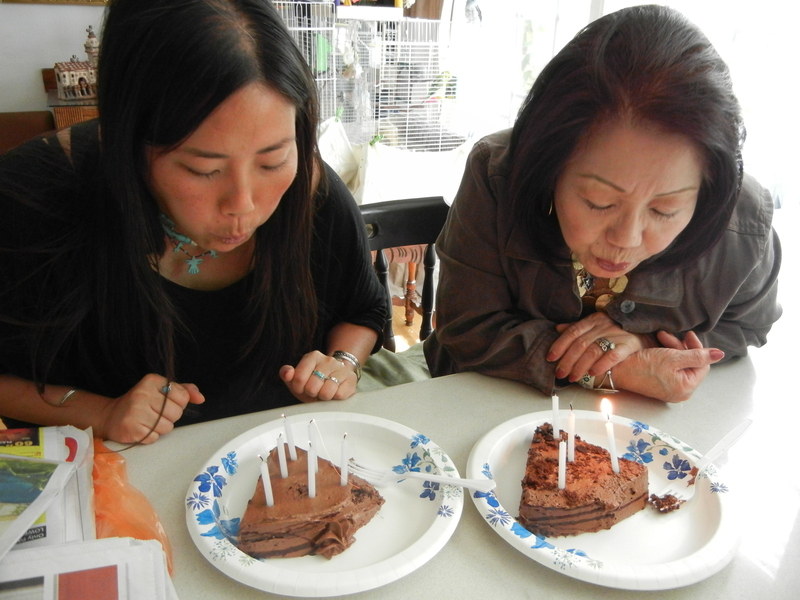 Blowing out candles never gets old, does it? I made my wish!!! 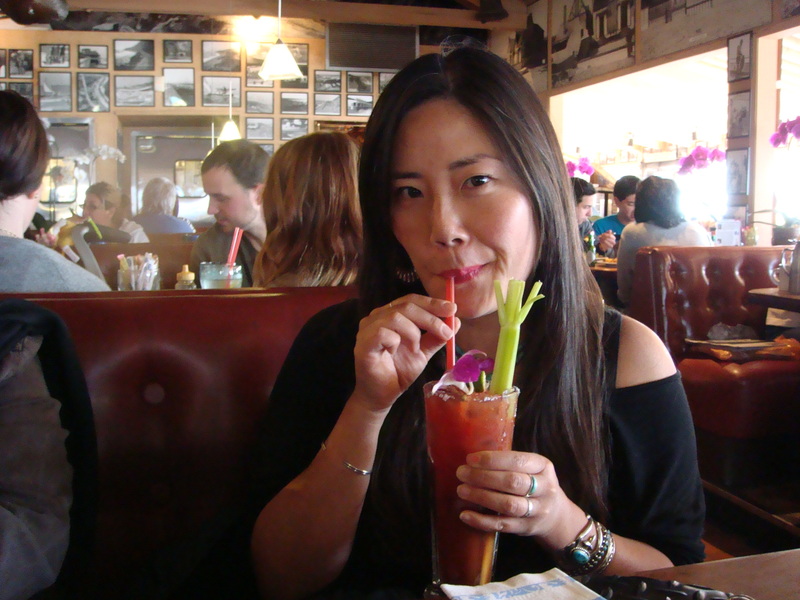 After cake, I promptly went upstairs to take a nap, due to the 2 bloody marys. Thanks for all the happy birthday wishes! Have an awesome week! sounds like a great day for the Nishino clan! 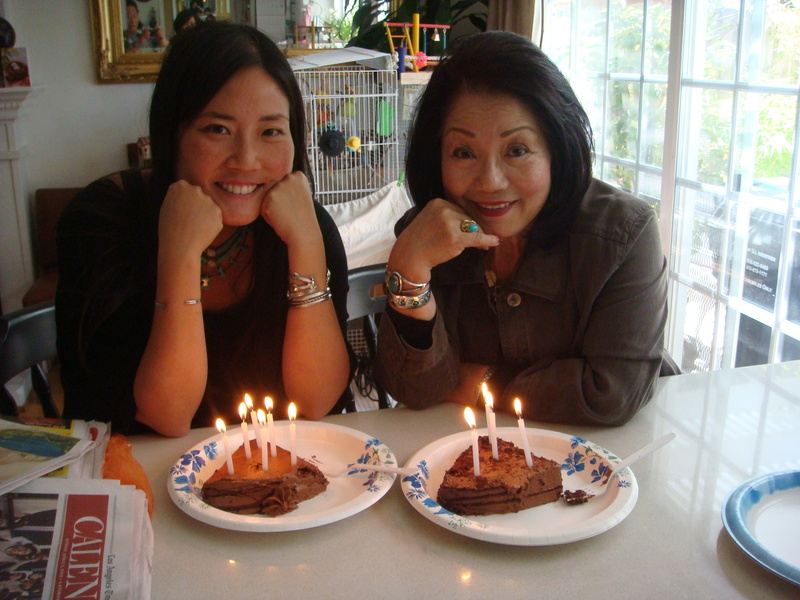 Happy birthday Shelli and Hiroko-chan! Thanks A!!!! 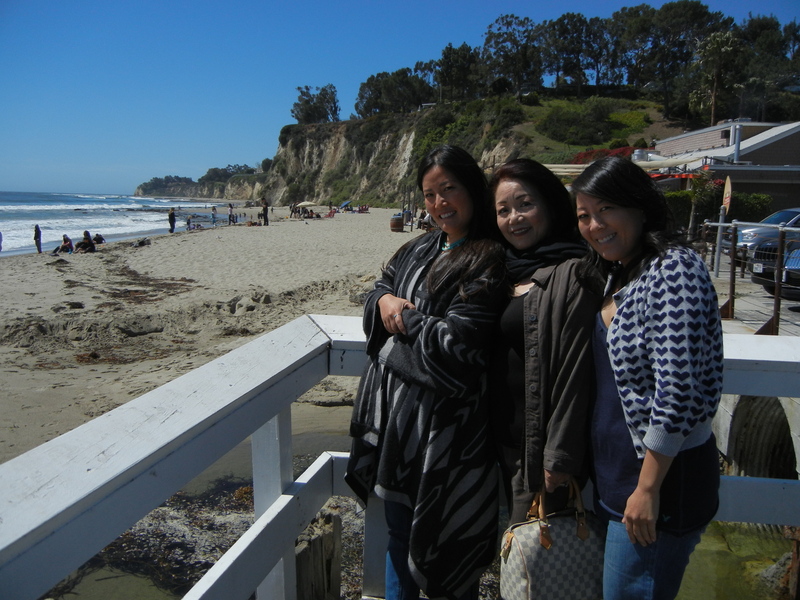 It was the most perfect Southern California day ever!!!! Please call us when you are here. We’d all love to see you…. I’m DEFINITELY calling the Hoiles clan when I come up there!!!! I can’t believe it’s been 6 months since I’ve been up there!!! 2 Mum, as well,…goodness i hope we don’t miss ur next ONE !!??! !